Boeing, the manufacturer of the troubled 737 MAX 800 aircraft faces hundreds of million dollars in insurance claims from survivors of victims of the latest fatal crash of its plane in Ethiopia, even as its stock closed 5.3 per cent lower in trading on Monday. A New York based aviation lawyer quoted by Reuters said Boeing may face lawsuits from victims’ families in the United States, where legal compensation payments for people killed in plane crashes could run around $2 million to $3 million per person. The firm may have a respite if the victims survivors choose to sue in Ethiopia where they are only entitled to a $200,000 compensation. The company’s share price briefly had its biggest one-day drop since the attacks of Sep. 11, 2001, falling as much as 13.5 percent early on Monday on fears that two crashes in such a short time could reveal flaws in the new plane. The shares later stabilised and closed down 5.3 percent at $400.01. They hit a record high of $446 last week. As Boeing faced market turbulence, the United States told airlines it was safe to fly 737 MAX 8 planes on Monday as investigators found two black box recorders that will help piece together the final moments of an Ethiopian Airlines jet before it plunged to the ground on Sunday. 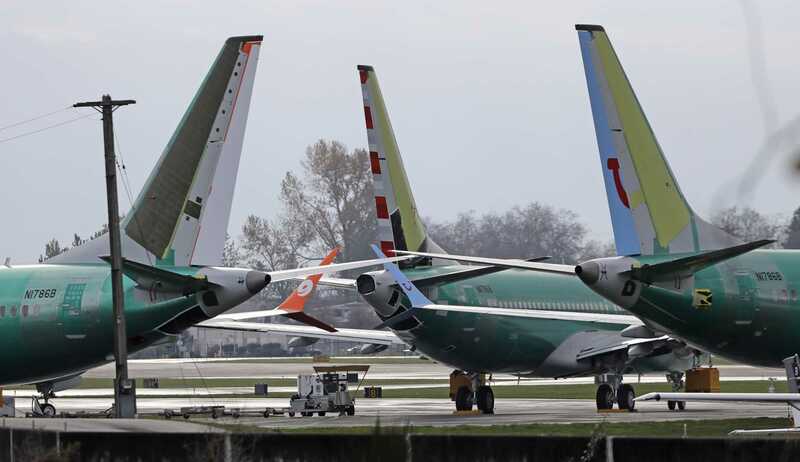 China and Indonesia grounded their fleets of 737 MAX 8 aircraft earlier on Monday, citing safety concerns, contributing to a drop in Boeing Co shares that wiped billions of dollars off the market value of the world’s biggest plane maker. Late on Monday, the U.S. Federal Aviation Administration issued a “continued airworthiness notification” to assure operators of the plane that it was safe to fly. It said it was collecting data on the crash and keeping in contact with international civil aviation authorities and would take immediate action if it identified any safety issues. Southwest Airlines Co, which operates the largest fleet of 737 MAX 8s, said it remained confident in the safety of all its Boeing planes even as it received a rush of queries from customers wanting to know if they were booked to fly on a 737 MAX 8. “Our customer relations team is responding to these customers individually, emphasizing our friendly, no-change fee policy,” the No. 4 U.S. airline said in a statement. Investigators in Ethiopia found two black box recorders early on Monday that will help piece together the final moments of the plane before it plunged, trailing smoke and debris, and crashed killing 157 people. The disaster came just months after a jet of the same model came down in Indonesia killing 189 people. The discovery of black box recorders means the cause of the crash may be quickly understood, as long as recordings are not damaged, although it typically takes a year for a full detailed investigation to be completed. Boeing Chief Executive Dennis Muilenburg said he was confident in the safety of the 737 MAX in an email to employees which was seen by Reuters. The Ethiopian Airlines 737 MAX 8 plunged into farmland minutes after take-off from Addis Ababa for Nairobi on Sunday. “The plane was very close to the ground and it made a turn. We looked and saw papers falling off the plane,” Malka Galato, the farmer whose land the plane crashed on, told Reuters. The plane tried to climb but failed, then swerved sharply trailing white smoke and objects including clothes before crashing, said farmer Tamirat Abera. The victims came from more than 30 countries, and the United Nations said they included 21 members of its staff. The UN had earlier said 22 of its staff were on board. The 737 line, which has flown for more than 50 years, is the world’s best-selling modern passenger aircraft and viewed as one of the industry’s most reliable. The new MAX 8 variant, with bigger engines designed to use less fuel, entered service in 2017. By the end of January this year, Boeing had delivered 350 of the new jets to customers, with another 4,661 on order, and they could become the workhorses for airlines around the globe for decades. Various worried nations took swift action after the crash. Ethiopian Airlines, which has four other 737 MAX 8 jets, said it was grounding them as a precaution. China also ordered its airlines to suspend their 737 MAX 8 jets. Noting that the accidents involving newly delivered planes had both taken place shortly after take-off, the Civil Aviation Administration of China (CAAC) said it would notify airlines when they could resume flying the jets, after contacting Boeing and the U.S. Federal Aviation Administration (FAA). The crash may scupper a potential commitment by China to buy more Boeing-made aircraft as part of a deal being negotiated to end a months-long trade war between China and the United States. Indonesia, where a Lion Air 737 MAX 8 went down in October, said it would temporarily ground the model for inspection.